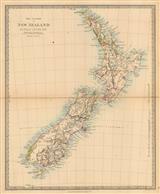 Description: Three maps on one sheet showing Cook's discovery of Tolaga Bay, Mercury Bay, and Bay of Islands on the North Island of New Zealand. English edition. Description: Cook Strait, the narrow body of water which separates the North and South islands of New Zealand. Discovered by Capt. 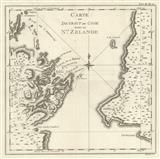 James Cook in 1769 during the first circumnavigation of New Zealand. French edition. Description: Dusky Sound and Resolution Island. Located in the Fiordland National Park near the southern tip of New Zealand's South Island. Dutch edition. Coloured. Title: : Partie de la Nle Zelande. Description: South Island. Early large scale map of region. Original colour. 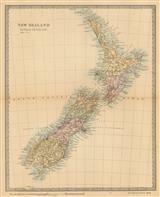 Description: Elegant map of New Zealand by the Society for the Diffusion of Useful Knowledge. Original outline colour. Description: Middle Island. Charming map to illustrate the paper by Captain Stokes. Coloured. Description: Middle Island. Detailed map to illustrate Mr Brunner's Paper published in 1851. Engraving by John Arrowsmith. Original Colour. 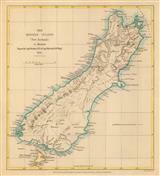 Description: Province of Otago. Southern districts. Illustrating the Journal of J. Turnbull Thomson. Coloured. Description: Detailed map with a side elevation on the lower edge. Bright original colour. 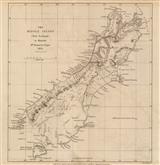 Description: Canterbury and Otago charting Dr. Hectors journey to Lake Wakatipu in 1863. 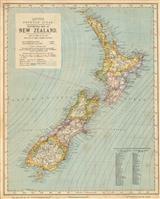 Inset of New Zealand. Original colour. Description: Canterbury Province. Detailed topographical map and five sections showing routes between the East and West coasts. Illustrating the paper by Haast. Original colour. Description: The Southern Alps in the province of Canterbury. Reduced from a large map by Julius Haast. Printed colour. Description: New Zealand. Shows the Provinces marked in various colours. Description: New Zealand. Middle and South Islands. Original outline colour. 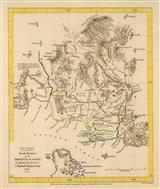 Description: Detailed map in original colour. 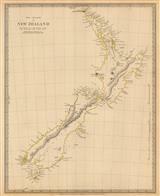 Description: New Zealand with detailed reference panel, showing the ocean currents. Printed colour.